¡Hola! ¿Qué tal? Greetings from Madrid–Spain’s capital city and the heart and soul of its vibrant culture. My first 10 days here have been filled with incredible sightseeing, countless new encounters and unforgettable experiences, and some less glamorous communication fails as I continue to learn about and adjust to the Madrileña way of life. My first discovery was that Madrid is truly a city that never sleeps–a lesson made particularly difficult to cope with due to the jet-lag I was battling the first week of my travels. From the shops and flea markets in the morning to the tapas and discotecas that continue all through the night, the city is literally teeming with life at every hour of the day. Out of self-preservation, I have learned to fully embrace the traditional Spanish “siesta,” aka taking a much needed afternoon nap! I’ve also slowly been learning to fit in with the Spanish norms of behavior and experienced my first bit of success just this morning when I was mistaken for a local (I proceeded to give the poor woman false directions in broken and heavily accented Spanish). However, my first few days were full of confusion and social blunders as I might as well have broadcasted to all of Madrid that I was an American tourist. Here in Spain, blatantly staring at strangers is seen as perfectly acceptable, yet offering them a friendly smile is considered too forward. Needless to say, this took some getting used to, as I spent my first few days awkwardly smiling at everyone who looked my way on the Metro! Along with making these discoveries, I have been busy familiarizing myself with the city through visiting many of the famous parks, monuments, and museums such as Retiro Park, the Palacio Real, Catedral de la Almudena, museo del Prado, and Reina Sofía in addition to starting classes at La Universidad Rey Juan Carlos, moving in with my host family, and taking daily excursions to various surrounding areas. This past Saturday, USAC took a day-trip to Toledo, the historic capital city of Spain. Only an hour away from Madrid by autobús, this trip offered a great opportunity to learn about the rich history of Spain and its mix of religious cultures as well as to take stunning pictures of the ancient city! With events such as the much anticipated World Cup starting on Thursday as well as the recent abdication of the Spanish King Juan Carlos, I couldn’t have asked for a better time to reside in the hub of Spanish culture. I’m excited for my weeks here to come and can already tell that it will be muy difícil to leave at the end of the month! 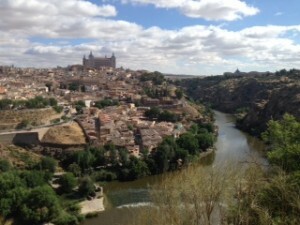 The beautiful city of Toledo!